13"tall, 7" x 7"wide. Click photo to enlarge. This Jar will be personalized on biscuit shaped handle. 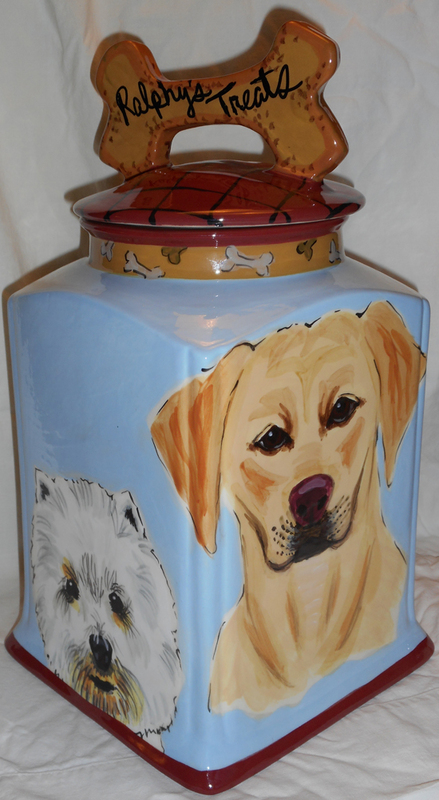 Four dogs are painted on this jar. A Shepard, Westie, Terrier and Yellow Lab. Allow 4-6 weeks delivery. Great Cookie Jar for your dog's Treats! Four adorable dogs are painted on this dogie treat jar. A Shepard, Yellow Lab, Westie and Terrier. We can also personalize it for you by adding your dogs name to the biscuit shaped handle.